But Dominican beans… I don’t really know from Dominican cooking, except for some bits of embarrassingly vague knowledge about pan-Caribbean foodways. So I suspect when I saw that recipe title I just had to know what was up. And when I did look, the recipe was so intriguing! 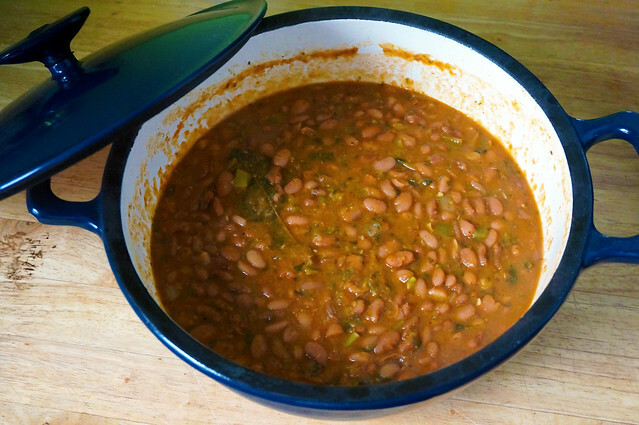 Most of the bean recipes I cook hail from the Southwestern U.S., and I hadn’t previously realized how that limited my ideas of what a pot of beans ‘should’ taste like: heavy on pork and chiles, boldly flavored and spicy. 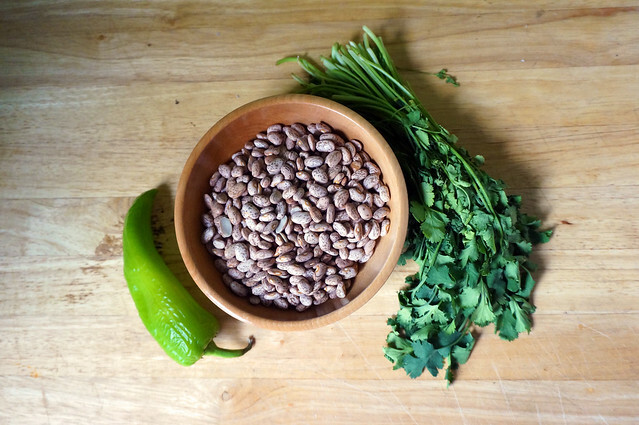 But these beans are something else entirely: my beloved pinto beans are there, yes, and all the seasonings are familiar and ordinary, but the way they’re deployed is terribly different from my expectations, more subtle and almost delicate. There’s chile, but instead of a robust dried red ancho or guajillo, or a smoky, fiery chipotle en adobo, it’s an Anaheim chile, pale green and sprightly fresh. There’s tomato, but it’s far out of the spotlight, just a background supporting player. There’s cilantro, but it’s stewed so thoroughly that its bright flavor, usually prominent, fades to a background layer. Instead, the flavor that comes out front is, of all things, bay. (Yes, I’m still on a bay kick.) With all the other flavorings dialed back, bay leaf’s citrusy minerality gets to shine out front, playing off the richness of the pinto beans in a back and forth that’s intensely satisfying. Paired with some lightly flavored rice, this is a brown-bag lunch that I’m always very happy to eat. 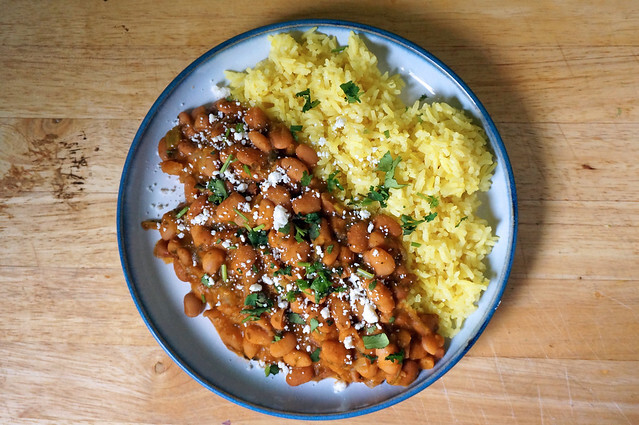 It’ll never replace the pinto beans of my childhood, but this dish taught me some new things about how to eat beans, and it has a permanent place in my rotation. These beans have been a very welcome variation to my bean rotation ever since I first tried them. 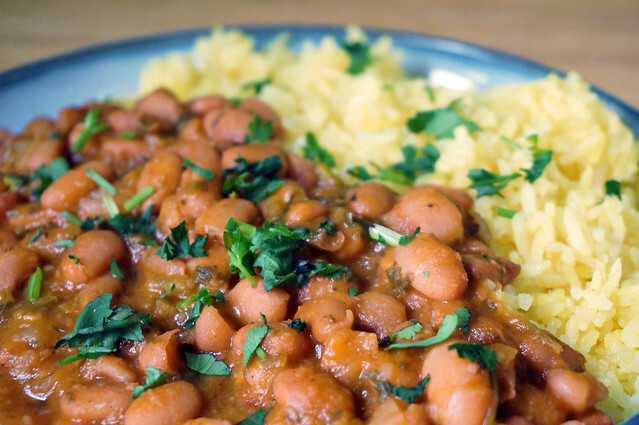 If you, like me, are accustomed to the bold and spicy pinto beans of Texas and the Southwestern U.S., do yourself a favor and give these a try: spicy flavors take a backseat, and the warming complexity of bay leaf gets to come to the fore and play with the richness of the beans themselves. Soak the beans in well-salted water. You can do this overnight in room temperature water, or you can bring them to a boil, then let them sit for an hour or so for a quick-soak. Either way, drain them before moving on. In a large pot over medium-high heat, saute the onions in the olive oil until they are somewhat soft and turning translucent, about five minutes. Add the garlic and saute for another minute or so. Add the drained beans and the chile, cilantro, bay, oregano, pepper, and salt, as well as enough water to cover (about 5 cups). Bring to a boil, then reduce heat to very low and simmer until the beans are tender, about an hour. Add the tomato paste and vinegar and simmer another twenty minutes or so, until the broth has thickened and become almost creamy. Taste and adjust seasoning, then serve as a side dish, or as a simple dinner with rice. If you’d like, you can used 3 cans of beans instead of starting from dry. Just rinse and drain them, and then begin by sauteing the onions. You won’t need to simmer for a whole hour, since the beans are already cooked, but give it a good 20-30 minutes so the chile and cilantro have time to stew thoroughly. Garnishes! 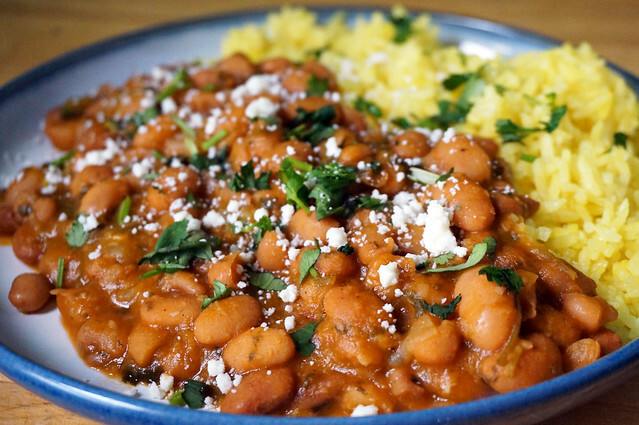 I’ll admit that I originally sprinkled cotija cheese in these pictures simply for the visual interest, but it turns out that a sprinkle of salty, crumbly cheese melds very well with these beans, so I recommend that, as well as some chopped fresh herbs.